With the signature of the Treaties of Rome in 1957 (that established the European Economic Community, which came into force on 1st January 1958, and the European Atomic Energy Community or Euratom, which came into force in 1967), a twinning agreement between cities from the six founding countries was signed in Liège, on 3rd July 1958, during the General Assembly of European Municipalities. At a north-south and east-west crossroads, the discovery of iron ore and the development of the metallurgy industry in the 20th century soon made Esch-sur-Alzette a modern, constantly booming and active town. Today, for its inhabitants and visitors Esch-sur-Alzette offers all the facilities and services worthy of a dynamic and evolving conurbation, in the heart of a Europe in the midst of profound change. Its continual quest is to combine historical heritage and futuristic visions of a town that is ready for new challenges. 'Iron town' celebrated its centenary in 2008 and for the occasion, Esch-sur-Alzette commited to a series of major urban projects and plans for the future aimed at civically and fairly developing its quality of life, economy and cultural as well as technological influence. The municipality has a population of 28,000 and is the administrative centre of an urban area with 40,000 inhabitants. 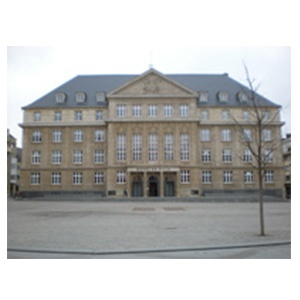 It is located 10 and a half miles from the capital of the Grand-Duchy.